Place the potatoes in a pot of salted cold water. Bring to a boil; reduce heat and simmer until tender (~10 mintues). Drain. Mash the potatoes and spread on a baking sheet to cool. In a mixing bowl, whisk the eggs. Add the cooled potatoes, flour, salt and nutmeg to the eggs. Mix with a wooden spoon until a heavy dough forms. If too wet add a little more flour. On floured surface, cut dough into 20 pieces and shape into round balls. Bring a large pot of salted water to boil. Carefully drop the dumplings into the boiling water and cook until they float to the surface (5-10 minutes depending on the size of your dumplings). Allow to cook an additional minute or two. Remove dumplings with a slotted spoon. Optional: Heat a few tablespoons of butter in a skillet on medium high. 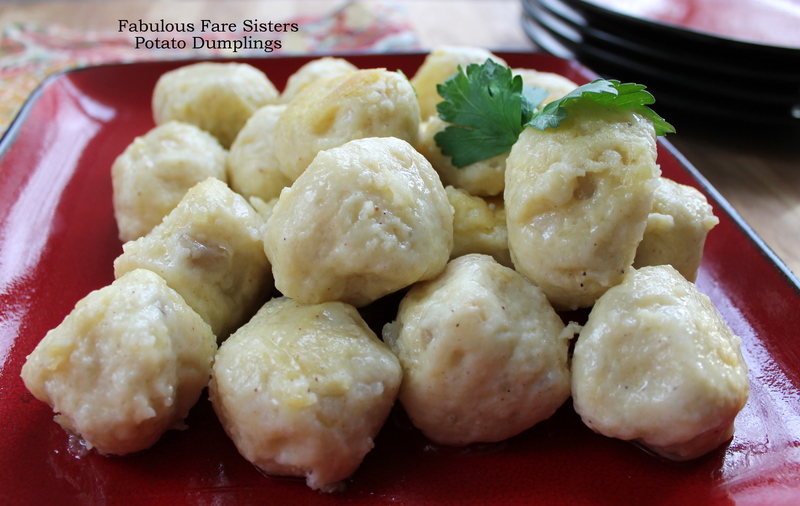 Gently sauté the cooked dumplings in the butter until coated on all sides. Serve hot. 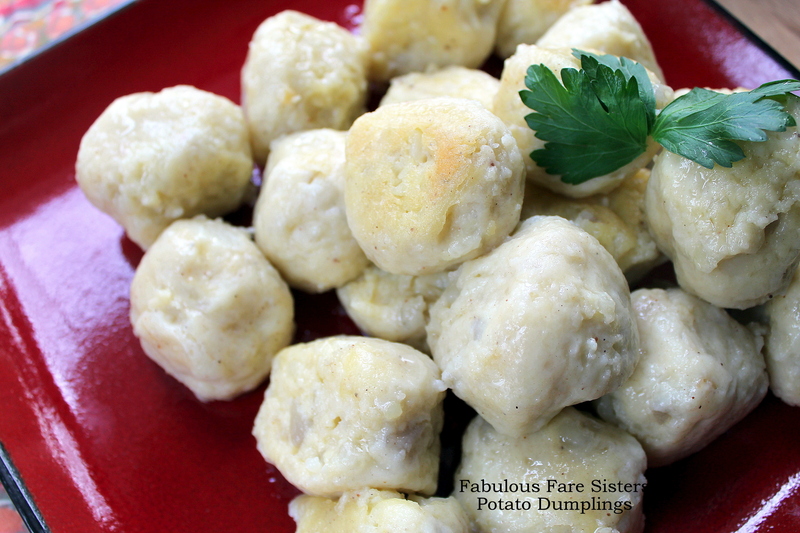 You can also top these dumplings with your favorite gravy. Delicious! This recipe has been shared on The Pin Junkie, Funtastic Friday, Fiesta Friday, Senior Salon and Saucy Saturdays along with Family Joy Blog…go check it out and then go visit some other great sites! I have nominated you for the “Blogger Recognition Award”. You have an outstanding blog. I’m sure your grandmother is delighted! Great photos too! 💖 I hope you will accept the award. You need to go to my blog for details. simplysplendidfood.com. Thank you for having a great blog! These looks sooooo good. Thanks for sharing. I’ve made it with cooked onions and mushrooms. (Minus the nutmeg). Nice. Good way to use us leftover mashed potatoes. A great way to make potatoes. Will try this one. These are quite similar to gnocci. Lovely post. Yum! These look like pillows of love!